May Giveaway Day!!! - Stop staring and start sewing! Yay! It's Giveaway Day again!! I'm so happy to take part in Sew Mama Sew's May Giveaway Day! I joined in back in December and it was lots of fun and I made lots of new friends! I'm trying to think of a creative way to pick the winner but it's late and my brain is out of gas so I'm going to be lazy and let random.org pick as usual. Just tell me (and everyone else) the name of your absolute favorite all time fabric print. Mine is probably Amy Butler's Sunburst print from her Temple Flowers line. Oh I loved that collection! It's the fabric that made me fall in love with the "good stuff". Little did I know I had "crossed over" and could never go back. Oh, and here's the prize! 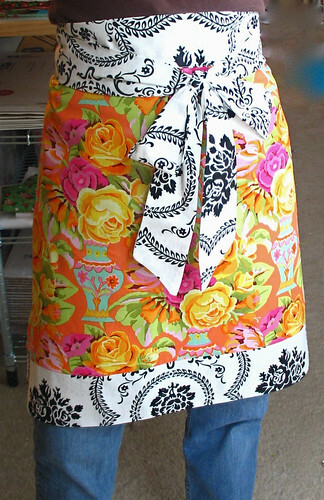 The Orange Kirman Apron Kit from my Apron in an Hour kits. The winner will get the fabric needed to make this apron (international is fine!) and I will email the downloadable pdf file. Blog post here. And great news! I just found out that Jennifer Paganelli's Dance with Me and Tanya Whelan's French Hatbox will be here this week (I'm thinking Thursday)! I've already loaded them into the store for purchase and will ship them out as soon as that big, strong, handsome UPS guy drops them off (not that I ever see his face because he runs off so fast after ringing the bell). I've got a few more lines coming in the next 2 weeks (Lantern Bloom, Full Bloom, and For your Home) and then it gets even crazier (3 huge collection toward the end of June)! If you're interested in receiving notices when new fabrics and patterns arrive just join my mailing list (at the bottom of the sidebar to the right). Good luck!! The drawing is on Sunday the 31st. Thanks for visiting (feel free to take a look around)!